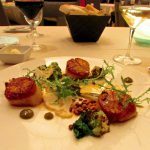 The coastline of La Jolla, San Diego showcases stunning views of the Pacific, rocky cliffs, and the occasional “Dr. Seuss” tree; but a different type of beauty has been carved into its craggy ridges. 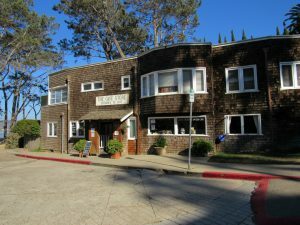 The seven ‘sister’ La Jolla caves are a unique attraction that have piqued the interest of curious onlookers since 1902, when Sunny Jim Cave was first discovered. They aren’t far from La Jolla Cove, and although they are not accessible by land, the other six sea caves possess their own distinctive attributes – and some are even the source of notable local legends. 1. They were originally utilized by pirates. For human smuggling! After an influx of immigrants in the 1800s (in 1868 alone, more than 12,000 Asian workers had come across the Pacific by the boatload to work on the railroad), rising prejudice led to strict immigration laws. These harsh restrictions began what was essentially the first commercial smuggling of human cargo in San Diego and throughout the United States. The La Jolla caves provided shelter for local pirates looking to make a buck off cheap labor. Today, sea lions and seals are more frequent visitors than pirates! 2. Each cave has a unique name. This is mostly so that lifeguards can identify them easily. From east to west, they are known as: White Lady, Little Sister, Shopping Cart, Sea Surprize, Arch Cave, Sunny Jim Cave, and Clam’s Cave. Sunny Jim Cave is still the only cave you can access by foot, via The Cave Store for a small entrance fee. There are 145 steps down, but the walk is worth it – there is an incredible view at the end. 3. They are nearly 75 million years old. The seven La Jolla Cove caves were carved out from a 200-foot high cliff of Cretaceous-age sandstone – meaning they are about 75 million years old and one of the oldest geographical landmarks in the area. High tides and the same forceful waves we see today helped move along the process. 4. Sunny Jim Cave took two years to tunnel through. 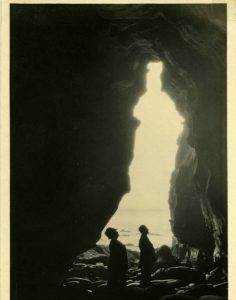 In 1902, a German professor named Gustav Shulz became fascinated with the caves he spotted along La Jolla’s coast. He hatched a plan to construct a tunnel through one of them to enable visitors a one-of-a-kind view – and charge them for it, of course, via the newly opened Cave Store. For the next year and a half, Schulz used a pick and a shovel to slowly tunnel upwards through the roof of the largest cave (Sunny Jim), finally emerging above the cliffs. It wasn’t until a few months later that he built the 145 wooden steps we see today and began charging admission (meaning that early descents were quite harrowing!). 5. Arch Cave is the second largest of the seven. Sitting just to the left of Sunny Jim sea cave and measuring 608 feet long, the cave features six radiating tunnels within its caverns – despite its incredibly narrow entrance and seemingly shallow interior. It is very difficult to access, especially at high tide; we do not recommend attempting to go inside! 6. ‘Sea Surprize’ contains colorful (and fossilized) marine life. Sea Surprize looks small from the outside, but to the courageous adventurer’s delight, it is said to house an additional 80 feet of walking passage beyond the entrance. According to some sources, orange streaks color the walls above a beautiful pool of water that contains (what are possibly) calcite-coated sea anemones. 7. White Lady is named for its tragic history. The cave is said to be named for a woman who, described as blue-eyed and beautiful, was swept to her death at the cave’s entrance. The story goes that sometime during the 1800s, she and her new husband were on their honeymoon in La Jolla. One day, the woman went hunting for sea shells along the beach and near the sea caves; the tide kicked up, and before anyone could save her she was struck by a wave and swept into the water. 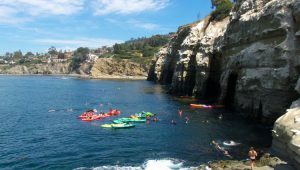 Today, you can take a kayaking tour and kayak through the largest of the seven, Clam Cave; Sunny Jim remains the only sea cave accessible by land. 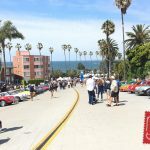 La Jolla, California is the only place in San Diego (and maybe even southern California!) that you can actually descend stairs into a sea cave – this incredible sight is definitely worth checking out if you are visiting.